‘Is there a greater tragedy imaginable than that in our endeavor (…) we should in fact unwittingly produce the very opposite of what we have been striving for?’ 1 The neoliberal political theorist Friedrich Hayek wrote these words in 1944, but we may still consider them when looking at the state of neoliberalism research today. In the last thirty years, the remarkable case of neoliberalism has drawn scholars from various disciplines. They have examined a movement of politicians without a party, without an election program and without a formal name. 2 Shared ideas were about the only glue that held the neoliberal ‘thought collective’ together, and therefore scholars have studied the internal ideological battles of the neoliberals intensively. 3 But the deeper researchers delve, and the more their knowledge advances, the more difficult it is to connect this ‘isolated’ neoliberal movement to the outside world. We have traced down the neoliberal movement accurately, but we struggle to demonstrate its wider impact. I would say that neither of these claims is true and that both images are the side effect of a specific treatment of ideology. Most studies on early neoliberalism sharpen the picture of neoliberalism by contrasting it to Keynesianism, its supposed opposite. The sharper the picture of neoliberalism gets, the blurrier the background becomes, and the more the reader gets convinced that the early neoliberal movement was isolated and marginal. By adopting this perspective, scholars neglect the impressive circulation of Hayek’s The Road to Serfdom (of which 600,000 copies were issued at the time) and the popularity of neoliberal theorists, such as Hayek himself and Wilhelm Röpke, who travelled all across Europe in the late 1940s with extensive lecture tours. 8 Most of all, however, they overlook ideological crossovers and turn a blind eye towards the influence of neoliberals within non-neoliberal parties. In the remaining ten minutes, I will introduce a concise case study that suggests extensive linkages between neoliberals and their ideological rivals in the era before Thatcher and Reagan. My case study concerns the relation between neoliberals and Christian democrats. Although absent in the United States and Great Britain, the Christian democrats are a major political force in most multiparty systems in continental Western Europe, where they usually occupy the political center. It is tricky to make general claims about the Christian democracy in general, but I feel safe enough to confine myself to three observations. First, Christian democratic thought is primarily concerned with the relation between state and civil society. Second, Christian democrats believe that organizational matters ought to be handled by the least centralized competent authority (subsidiarity). Third, Christian democrats favor cooperation between interest groups in society over direct state intervention (corporatism). With this brief outline in the back of our minds, let us turn our eyes to the early neoliberal movement. Whereas Anglo-American researchers initially highlighted the role of Friedrich Hayek and Milton Friedman within the neoliberal network, continental European scholars recently shifted their attention to other leading neoliberals, such as Wilhelm Röpke, Emil Brunner and Franz Böhm. These public intellectuals generally avoided the polemical language employed by Hayek in The Road to Serfdom, dedicated to the liberal cause and expressed to convince socialists how very wrong they were. Instead, Wilhelm Röpke carefully carved out a ‘third way’ between laissez-faire liberalism and socialism. This third way designated a particular form of market-oriented liberalism. Röpke argued that the market mechanism secured individual freedom, as competition prevented the accumulation of either economic or political power in the hands of the few, and thus thwarted individuals in their attempts to exercise power over others. 9 So far, Röpke’s argument ran parallel to Hayek’s views. However, whereas Hayek presented his line of thought as a continuation and perfection of the liberal agenda, Röpke presented his argument as a moderate ‘third way’ between capitalism and socialism. He carefully pointed out the linkages between liberalism and Christian social thought, embracing subsidiarity as an organizational principle, and acknowledging the role of the church as a counterbalance against the power of the state. Although Röpke fiercely rejected corporatism, he emphasized the key value of religion, most notably Western Christendom, as a necessary cultural and spiritual supplement to liberalism, which would otherwise become overly individualist. 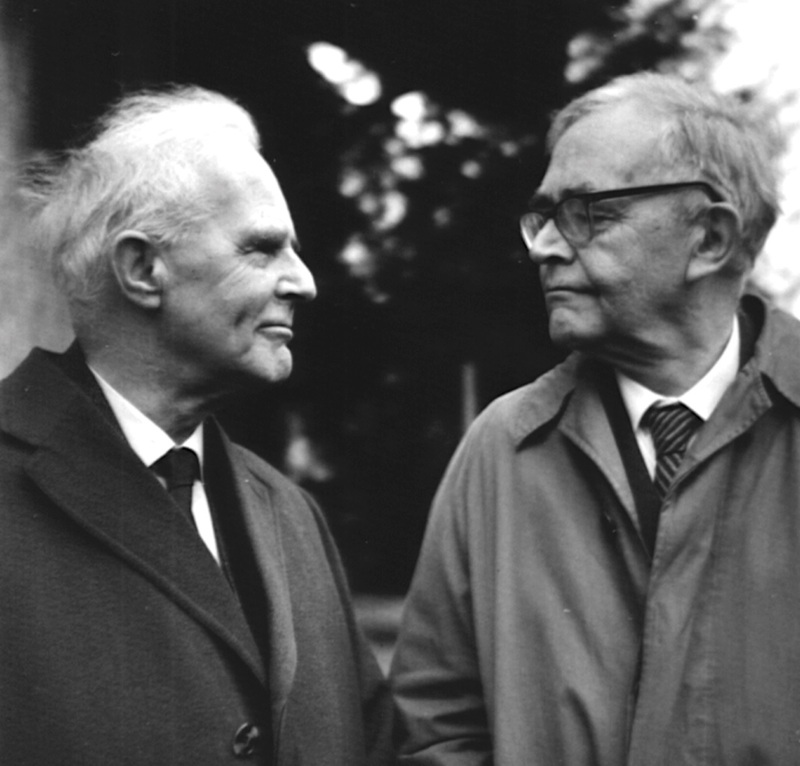 The most remarkable aspect of Röpke’s work was not that he acknowledged the value of Christianity per se. It is far more striking how he merged his belief in market-based competition and Christian-based spirituality into an overarching claim concerning the roots and sustainability of individual freedom as such. In doing so, he simultaneously demonstrated the value of neoliberal economic views for Christian democrats, and the value of Christian faith for the liberal agenda. The overt biblical reference in one of his Röpke’s main studies – Civitas Humana – demonstrates that this was more than a footnote in his work. At the same time, Röpke was a committed neoliberal and an active member of the Mont Pèlerin Society, the most renowned neoliberal think-tank of his days, of which he eventually became president. Within this ‘neoliberal international’, Röpke maintained ties with intellectuals who held similar views such as Emil Brunner, a Protestant theologian who was so dominant within his field, that he was invited to speak at the inaugural meeting of the World Council of Churches. Protestants took the lead in establishing this authoritative ecumenical organization in Amsterdam in 1948. At that meeting, partly dedicated to the socio-economic agenda of the churches, Brunner warned his fellow theologians against overly individualist liberalism without community, and Soviet-style collectivism without individualism. 10 In a clear echo of Röpke, he proposed a ‘third way’ based on organizational decentralization (subsidiarity) and the market mechanism. 11 The devil of these days, Brunner warned, was state socialism, which depersonated the individual and created the conditions for totalitarianism. What we see in the work of Röpke and Brunner is an intriguing synthesis of Christian democratic ideas about state and civil society (decentralized state power) and neoliberal ideas about the relation between state and market (most notably the idea that the market, through the mechanism of free competition, contains state power and secures individual freedom). The question remains how this synthesis of neoliberalism and Christian democracy played out in daily politics. Although I do not aim to treat this subject systematically in the remaining seven minutes, a brief look at a specific case provides at least a first impression. This impression is based on the Netherlands, because not only it is my home country, which I know best, but also because it is the only Western European country where Christian democrats secured a parliamentary majority for fifty years, from 1917 to 1967. It therefore provides an ideal case to look at crossovers between Christian democrats and neoliberals, because any political coalition in the Netherlands necessarily included Christian democrats. As a result, the position of liberals and social democrats was weak: both parties could only enter a coalition if they were willing to cooperate with at least one of the three Christian democratic parties at the time. Despite this setback, the dominance of welfare state-related issues in politics after the Second World War offered opportunities for social democrats and neoliberals. Christian democrats had always been vulnerable when it came to socio-economic issues, as they united employers and employees with opposite economic interests. Due to the incompatibility of both parties’ interest, the Christian democrats had never managed to develop an economic school of their own, and economics as a profession, even in continental Europe, had become politicized along the well-known divide between Keynesians and neoclassicists since the economic crisis of the 1930s. Neoliberals and social democrats aimed to win the Christian democrats over to their camp, while the Christian democrats remained quite indecisive regarding socio-economic issues for fear of having their parties torn apart. It took another twenty years before a breakthrough was forced, and the concept of the ‘responsible society’ took on an unambiguously neoliberal meaning in the early 1980s, opposing a ‘responsible’ society of free and responsible citizens vis-à-vis a paternalistic and outdated welfare state – an image that still captures the public imagination today. That the ‘responsible society’ eventually took on a neoliberal meaning, and legitimated a series of pro-market reforms under the leadership of the Dutch Christian democratic Prime Minister Ruud Lubbers, was no coincidence. The right-wing interpretation of the term was by then the product of thirty years of ideological crossovers between Christian democrats and neoliberals. For Christian democrats, the concept implied a vivid and strong civil society, in contrast to an overly interfering state. The underlying idea of subsidiarity fitted almost hand-in-glove with the neoliberal plea for the market mechanism as an economic tool to curtail state power, although the rather combination of Christian democratic communitarianism and the neoliberal model of individual competition remains one of the most striking tensions of the Dutch neoliberal synthesis today. To conclude, I would like to summarize my argument three points. First, I hope to have demonstrated that neoliberalism studies has something to gain by examining the relationship between neoliberalism and competing ideologies. Such research helps to trace the wider influence of the neoliberal movement, not only from the 1980s onwards, but also in preceding decades. Secondly, I have argued that the early neoliberal movement owed much of its success in continental Europe to the inventiveness of a specific group of political theorists, who combined the neoliberal idea of the market with the Christian democratic idea of a decentralized state, in other words: subsidiarity. Finally, I would like to add that an approach focused on the crossovers between ideologies instead of looking at ideologies in isolation, does more justice to neoliberalism’s historical development. Ideologies do not possess a timeless, universal core. They depend on local context, they interact and they develop in relation to each other. In other words, ideologies evolve. F.A. Hayek, The Road to Serfdom (London and New York, 1944) 5. Angus Burgin, The Great Persuasion. Reinventing Free Markets since the Depression (Cambridge MA and London, 2012) 15. Dieter Plehwe, ‘Introduction’, in: Philip Mirowski and Dieter Plehwe (eds), The Road from Mont Pèlerin. The Making of a Neoliberal Thought Collective (Cambridge MA and London, 2009), 1-42; 4. Jamie Peck, Constructions of Neoliberal Reason (Oxford, 2010) 7. Angus Burgin, The Great Persuasion. Reinventing Free Markets since the Depression (Cambridge MA and London, 2012) 7-8. Bram Mellink, ‘The Great Transformers. Neoliberals and Keynesians as ideological rivals during the trentes glorieuses (1945-1975)’ (forthcoming). Burgin, The Great Persuasion, 197; Peck, Constructions of neoliberal reason, 40. Burgin, The Great Persuasion, 87-89. W. Röpke, Civitas Humana. A Humane Order of Society (London, 1948) 5, 10. Emil Brunner, De kerk en de ordening (Voorburg 1948) 5-6. Brunner, De kerk en de ordening, 7.